The bones of the human body allow us to move from place to place and provide protection to other organs. Some bones also produce blood cells. Our bones produce over two million red blood cells every second. Scientists consider the skeleton to be composed of two parts: axial and appendicular. The axial bones are located within the head, spine and ribs of the body, while the appendicular bones compose the limbs, shoulders and pelvis. The spine allows us to stand upright and protects the spinal cord. The adult body contains seven vertebrae in the neck area which are called cervical vertebrae. Next are twelve thoracic vertebrae, followed by five lumbar vertebrae. The sacrum is a fused area of five bones found below the lumbar vertebrae. The final three to five small spinal bones are fused together to form the coccyx, which is commonly known as the tailbone. The sacrum and coccyx extend into the pelvis. The skull is composed of the cranium, which is a set of eight bones that meet at areas called sutures. These protect the fragile brain. Fourteen facial bones complete the skull; these bones create our facial characteristics and allow us to eat. Facial bones include the lower jawbone which is called the mandible and the upper jaw which is composed of two bones called maxillae. Also inside the head are smaller bones, including those of the middle ear that assist us in hearing. These bones are known as the hammer, anvil and stirrup. The hyoid bone, located inside the neck, assists us with speech and is the only bone that does not touch other bones. The rib area contains the ribs and breastbone, also called the sternum. The skeleton has 12 pairs of ribs that protect the heart, lungs, stomach and other organs. The pelvis contains two hipbones known as os coxae. Each hipbone contains a pubis, an ischium and an ilium, which are fused together. These bones protect the bladder, reproductive organs and part of the large intestine. The shoulders consist of shoulder blades called scapulae and collarbones called clavicles. 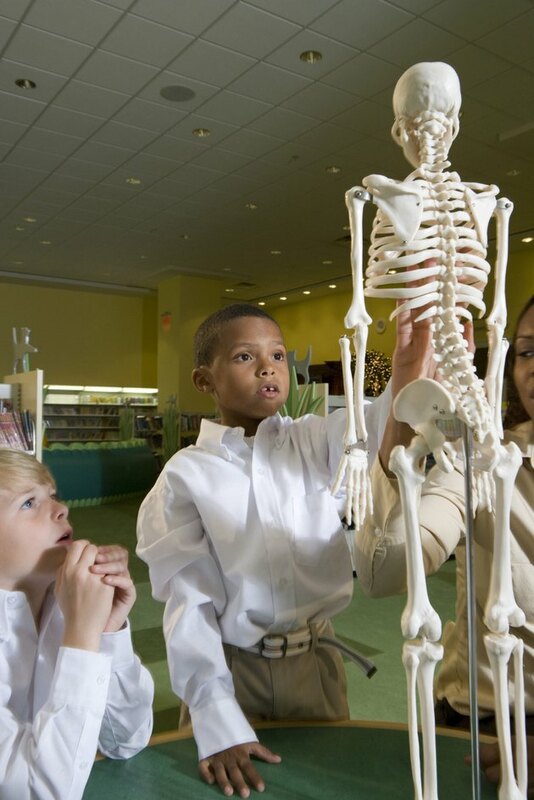 The large bone in our upper arms is the humerus, while our lower arms contain two bones called the ulna and the radius. Our hands contain carpal bones, found at our wrist; metacarpal bones, found in our upper hand; and phalanges, found in our fingers. All of these bones make it possible for us to complete necessary tasks and care for ourselves. The large bone in our upper legs is known as the femur and our kneecap is called the patella. Our lower legs contain two bones known as the tibia and fibula. Our ankle is called a tarsus, which is actually composed of seven bones. Our foot is comprised of metatarsal bones, while our toes contain phalanges. Our legs and feet allow walking and the ability to escape danger.